The 26th edition of India’s biggest travel and trade engagement show ‘South Asia Travel & Tourism Exchange’ (SATTE) was held at the India Expo Centre in Greater Noida, Delhi last week. The three-day event saw record participation by Indian and travel and tourism markets from across the world. Over 1,000 exhibitors consisting of representatives from 50 countries and 90 cities from India made it one of the most successful shows in recent times. The expo was inaugurated by Union Minister of State for Culture, Government of India, Dr. Mahesh Sharma along with Minister of Tourism Development, Wildlife and Christian Affairs of Sri Lanka, John Amaratunga. The other special guests present at the inauguration included Deputy Minister of Tourism, Arts and Culture Malaysia, Tuan Muhammad Bakhtiar bin Wan Chik, Deputy Minister of Tourism Marketing, Ministry of Tourism of the Republic of Indonesia, Nia Niscaya, Head of Regional Department for Asia and the Pacific, UNWTO, Eunji Tae, Sri Lanka’s High Commissioner in New Delhi, Austin Fernando, and Member, National Tourism Advisory Committee of India, Subhash Goyal. Speaking at the inauguration Minister John Amaratunga highlighted the growing importance of the Indian tourism market for Sri Lanka and noted that there was great potential for rapid growth. “We are far from realizing the full potential of the Indian outbound market in terms of longer staying and higher spending visitors. Our goal is to make Sri Lanka the most preferred destination for Indian tourists, more specifically the MICE segment. Sri Lanka is already a popular destination for Indian corporate events, weddings, exhibitions, seminars, workshops, concerts etc. Due to the close geographical location, excellent air connectivity and cheap airfares, India is in an ideal position to take advantage of the vast tourism offerings that Sri Lanka has to offer,” he noted. SATTE 2019 kept up to its reputation as a comprehensive B2B platform catering to domestic and international buyers and professionals from across the travel, tourism and hospitality industries along with National and State Tourism Boards. The expo enabled professionals to congregate and conduct business, arrive at solution-driven innovations to counteract economic uncertainties and promote inbound, outbound and domestic tourism in India. 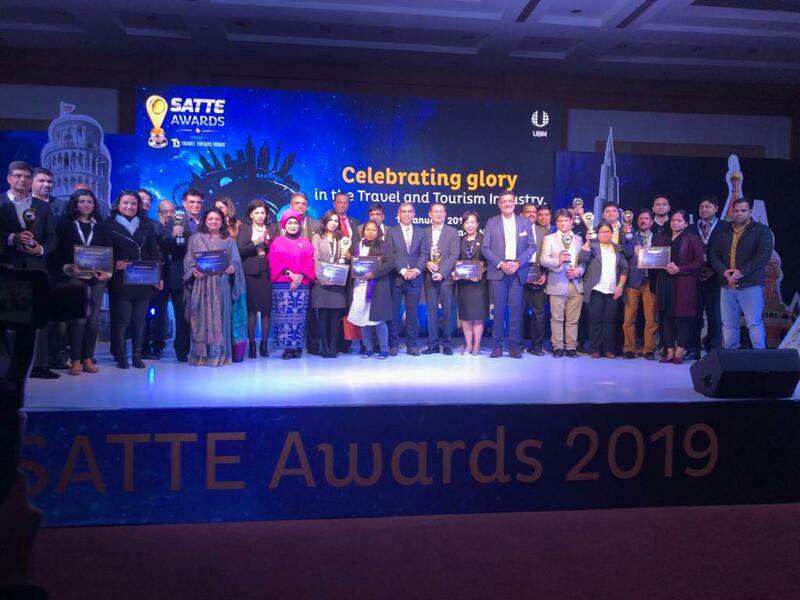 Minister Amaratunga also participated at the 3rd Edition of SATTE Awards on day 2 of the expo which was held to recognize excellence, triumphs and innovations of key stakeholders. Sri Lanka Tourism Pavilion at SATTE was inaugurated by Minister John Amaratunga along with Sri Lanka’s High Commissioner in New Delhi, Austin Fernando and Senior Advisor to the Minister, Felix Rodrigo. A total of 54 companies participated at SATTE 2019 which is the highest participation recorded at the expo.